He doesn’t look much like a Lightning Thief, does he? 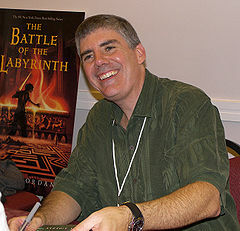 But, Rick Riordan, author of the Lightning Thief which has just come out last week in movie format as Percy Jackson and the Olympians, is doing very well for himself. Rick was a successful adult mystery novelist when he switched his focus to writing for teens. His first book about demigod Percy (Perseus) Jackson called THE LIGHTNING THIEF came out in 2005. By 2009 they were making a movie out of it, and I watched the film last Saturday (Feb. 20, 2010) along with my son and his friend. From book to big budget movie in less than five years–that’s pretty much stealing the lightning as far as I can tell. I liked Percy Jackson and the Olympians. The movie did exactly what it was supposed to do–that is, it entertained us for about 2 hours. The wizards of special effects were their wonderful wizardly selves. The battle with the Hydra in the Parthenon in Nashville, Tennessee (the Athens of the South) was incredibly well done–I loved it. The stars were all good looking and bought into their parts enough so that you could believe in them. The Olympic Pantheon was godly and arrogant. (A note about the Parthenon: I didn’t know this place existed, but now that I do know I’d sure love to see it in person some time. I took this description from a webpage promoting Nashville as a tourist destination. Percy Jackson (the movie) reminded me of Harry Potter (the movie). There are a lot of similarities. Both are about teen boys who come from disfunctional families but turn out to be special–gifted far beyond mere mortals. Both films move from the mundane to the magical quite quickly. Both show the hero with a cast of sidekicks and friends–one of whom is a truly fantastic girl–without whom they would have failed in their quests. Both stories take the protagonist to a special academy (Hogwarts and Camp Halfblood) for further training with others who are like them in magical abilities. Both have wise kindly bearded magical teachers from mythology. (Hagrid the Giant and Chiron the Centaur) Both feature a modern boy dealing with essentially ancient magics, traditions, horrors. Although the stories seem different in events and setting, they are both versions of the Hero’s Journey–both of our young heroes have to fight the Forces of Darkness. Hmmmm? Have I just rediscovered the bonafide sure-fire secret of success in writing Teen Fantasy? Dang! It’s one thing to know the secret in your mind. It’s quite another to successfully apply it. However, I’d like to examine an underlying premise for this movie–namely that the gods of ancient mythology are real. Because they are gods, they never did die off or vanish. There’s a scary corollary to this idea. If one ancient pantheon is real, then they are probably all real. D.C. Comics uses the Olympians as the basis of their Wonder Woman books. Marvel Comics likes the Norse pantheon better, but they use the Olympians too. i believe both Hercules and Ares are running around in the Marvelverse at the moment. If the Greek gods exist, then the Norse gods exist, and the Egyptian gods exist, and the Chinese gods exist, and the Brahmin gods exist, and the Voodoo gods exist, and the Polynesian gods exist. Hell! Maybe Chthulhu and the Old Ones even exist! There are hundreds of polytheistic pantheons in the world. How do they all manage to co-exist? And how do they manage to keep existing when Jehovah/Allah wants to be the only god? I guess the only way to reconcile the existence of many gods is to say there are no gods. Beings exist who are more powerful than we are, and they may share the world, galaxy, or universe with us, and they can do amazing things–live almost forever, control nature, explore the furthest boundaries of time and space, but they aren’t truly gods. They’re just different kinds of people–different from us in the same way that we differ from chimpanzees or howler monkeys. Maybe I’m expecting too much from the word GOD. Christianity has me all caught up in believing that gods are all-powerful, all-knowing, eternal, but people haven’t always seen them that way. To be a god, it is sufficient to be more powerful and more intelligent than mere mortals. People are gods to dogs and cats and cows and horses and chickens and many other creatures. Aardvarks are gods to ants and termites. Maybe all godhood really requires is more power, more intelligence, and greater life span. By that standard the universe/world is full og gods. 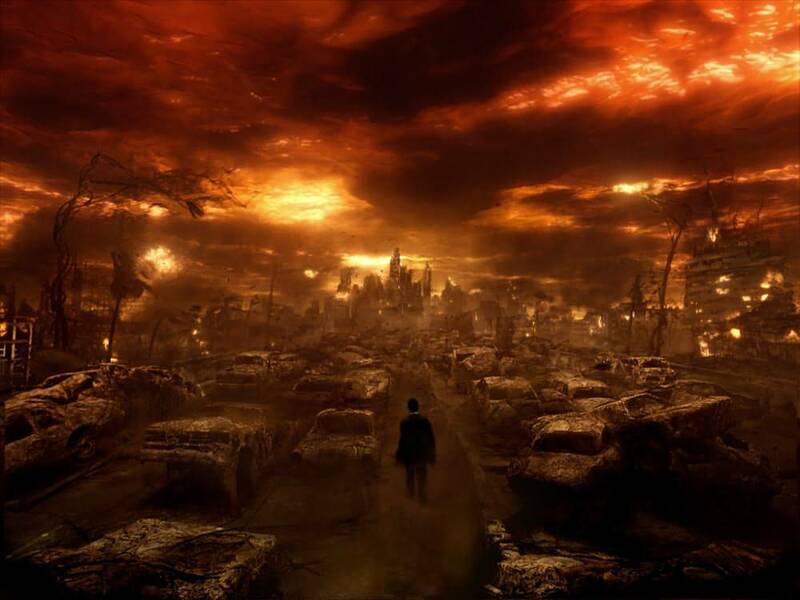 Which leads me to wonder, why aren’t the gods fighting it out amongst themselves for total controll of everything? If there is one thing the various mythologies agree on, it’s that gods aren’t real good about sharing their powers with others. Zeus and his followers killed the Titans who were the gods before them. Set did a number on Osiris. Loki schemed to get Baldur the Beautiful slain, and if Marvel comics has the right of it, he will never stop until he destroys Thor and rules Asgard. The mythologies of the world are full of struggles between one god and another. Why aren’t they fighting? Maybe they are. Maybe they work on a different time scale than we do. Just like dogs would never understand what it takes to build houses or drive cars, maybe we can never understand what the gods are really doing. Maybe global warming is just a ploy by Thor and the Asgardians to defeat the Ice Giants here on Earth. Maybe. You know, I don’t want to think about the gods any more. That way lies madness! And whom the gods would destroy, they first make mad. It does seem like there is an awful lot of madness in the world. It could mean that the gods are hard at work here after all. Had I known it was Drew’s story, I would have put a bet down and made some money on the Superbowl. If you check his life history, you can see how everything has been building to this moment. He is a kind of superhero who has accomplished incredible things from high school through the present. And he seems to be a really nice guy. So, I’m glad the Saints won the Superbowl. 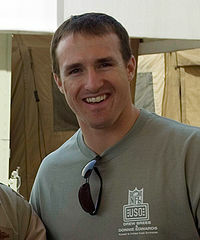 It’s a feel good story for America, and a climactic moment in the hero tale that is the life of Drew Brees. Warner and Favre and Manning have already had their triumphs–time to let a newer, younger hero have his moment on the stage. Whose story do you think it will be next year? Actually, I didn’t want to escape from DundraCon this year. I could have gladly stayed another day. Time, money, having to go back to work–all of these things make us gamers go home eventually, but it was with some reluctance that I left lovely San Ramon and the gracious Marriott Hotel at the Ranch to return to sunny Phoenix, Arizona on Sunday afternoon. I go to sci-fi and gaming conventions mostly to see my friends. It turns into real vacation time because I get to stay in luxurious hotel rooms where there is no limit on how long I can stay in a really hot shower. But, I’m not rich. I can’t do this sort of thing very often–once or twice a year at most. The good thing about attending conventions close to home is that travel costs are minimal, and I usually don’t even get a hotel room. The good thing about going to distant conventions is that you never have to leave the Con, and you live like a king for the weekend. I spent the Valentine’s Day/Presidents’ Day living like a king at DundraCon 34 in San Ramon. Since I am a game designer of minimal fame (Tunnels & Trolls, Stormbringer, Wasteland–a few others that you’ve never heard of), the people who run the convention will often give me a free membership, and in return I try to provide programming content for them. As every Game Master knows, it is great to be at a place where lots of gaming is going on. It is even greater if you are the one running the game. I had five things to do at DundraCon this year–three seminars and 2 demo games of Tunnels and Trolls. That’s enough to keep a guy pretty busy. And I connected with 4 special friends (Rose, Mac, Larry, Steve–last names withheld to protect the innocent) and made a new friend–Ron. I don’t need a lot of friends to make me happy–in fact I’m happiest in a small group, two to six, of intimates–people I know really well and vice versa. My seminars earned me free admission this year. I did one on the History of Tunnels and Trolls. Rick Loomis (CEO of Flying Buffalo, Inc. and President of GAMA) and I got to talk about all the great things we’ve done with T & T over the years. We created the solo dungeon, the first fantasy gaming art calendar, first American rpg in Japan, first publication of the beautiful fantasy art of Liz Danforth, and several other things since my game was created in 1975. We ran out of time before we ran out of things to say, so we didn’t quite get to tell them about the latest innovations and what might happen in the future. Stay tuned. The second seminar was with Steve Perrin and Ken Hite and was called “I remember when a D10 had 20 sides.” Did you know that back in the early days of gaming, the only available were the regular polyhedral solids? That meant d4, d6, d8, d12, and d20. Back in the day there were no natural d10s, d30s, d100s. To roll a d10 required having a d20 and simply ignoring the ten’s column except for the 10 itself. In those days, the primitive d20s ran from 0 to 9 twice and the numbers were just stamped into the plastic. Gamers would take magic markers and color in half of them to get the full range of 1 to 20. So the three of us, old pros all, got to sit in front of a room of people and tell shaggy dog stories about the first five years of rpg-ing. I now know why there were barbarian ducks in the early editions of Runequest. These things don’t just happen. There are bizarre real world circumstances behind them. (I’d repeat the story, but I’ve forgotten half of it already–it wasn’t my story.) Again, we ran out of time before we ran out of things to say. My third talk was about turning your gaming work into fantasy fiction, and it boiled down to just do it. Ken Hite and I explained just how hard and/or how easy it is to do such things today. We mentioned the people who went on to become well-known fantasy and sf writers. Weiss, Hickman, Salvatore, Feist, Stackpole to name a few of the more famous. St. Andre, Stafford, Gygax, Barker, and many others to name a few of the less famous. It might have been the best of my seminars. One attendee bought two of the three books i brought with me. My two games of T & T were teaching games and we had a good time while showing new people how T & T really works. In the second one I found myself inventing a new card game on the spot. It’s called Ogreocre, and I’m now trying to improve it, and turn it into a marketable thiing. Although it’s a betting game like poker, it could also be a token collection game. And I brought a lot of stuff to sell. Rick Loomis of Flying Buffalo, Inc. very kindly transported my merchandise, sold it for me in the dealers’ room, and gave me the money. The Con probably cost me about $500 to attend, but I got a hundred of it back from sales. It was worth it. If there are any gaming conventions in your part of the world, let me recommend that you go to them if you possibly can. They are the best fun a gamer can have while gaming.